Nautilus Inc. (NYSE:NLS) said its acquisition of Octane Fitness as well as a pickup in its retail business led to significantly improved revenues and earnings in the first quarter. The company makes fitness equipment under the Bowflex, Nautilus, Octane Fitness, Schwinn and Universal brands. Excluding an inventory step-up charge tied to Octane Fitness, adjusted earnings from continuing operations rose 10.1 percent to $12 million, or 38 cents a share. Net earnings improved 6.6 percent to $11.4 million, or 37 cents a share. EBITDA from continuing operations increased 14.7 percent to $21.1 million. Revenues jumped 25.7 percent to $120.9 million. The increase in revenues was driven by incremental sales resulting from the early-January acquisition of Octane Fitness. But Bruce Cazenave, Nautilus’ CEO, on a conference call with analysts, noted that organic retail business increased more than 20 percent, while the direct business increased 10 percent over the same period the prior year. “These are very satisfying growth numbers considering the recent events in the general retail environment and the challenging comparison period we faced in the direct business when revenues were up 46 percent,” Cazenave said. Gross margins for both the direct and retail segments increased; however, consolidated company gross margins declined by 110 basis points to 54.9 percent, reflecting the shift in channel mix as a result of higher retail sales growth, as well as a $700,000 non-cash inventory step-up charge related to the Octane Fitness acquisition. In the overall retail segment, including Octane, sales jumped 82.3 percent to $38.8 million. The continued success of Octane Zero Runner supported growth at Octane Fitness and the Zero Runner XR8000 was received well at recent trade shows. The recently-launched Octane Fitness XT-One cross trainer also is seeing continued healthy demand. Operating income in the retail segment more than doubled to $3.9 million for the quarter compared to $1.5 million. The improvement was primarily due to improvement in the organic retail business revenue and margins, coupled with the addition of Octane Fitness. Retail gross margin improved to 29.9 percent in the quarter, compared to 22 percent in the same quarter of the prior year. Excluding the inventory step-up charge at Octane Fitness, retail gross margins would have been 31.8 percent, up 980 basis points versus prior year gross margin of 22 percent. Octane sales in the first quarter were impacted by some softness in the overall consumer specialty segment, but this was partially offset by stronger performance in commercial products. Meanwhile, sporting goods and online sales were strong across multiple categories, including bikes, treadmills, and free weights. Further, international sales also grew strongly during the first quarter, primarily driven by the addition of Octane Fitness and the continued deployment of Bowflex Max Trainer, which is now available in 15 countries. 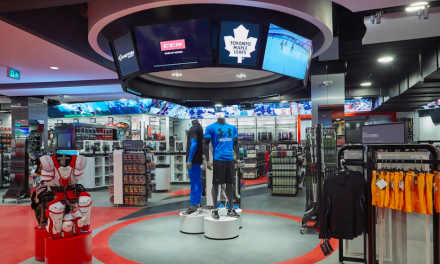 Regarding the bankruptcies in the sporting goods channel, Nautilus COO Bill McMahon said Nautilus fully reserved receivables for Sports Authority in the fourth quarter and has reserved a “small non-material amount” for the bankruptcy of Sport Chalet as well. At the direct segment, sales advanced 9.7 percent to $81.2 million, helped by continued strong demand for cardio products, especially the Bowflex Max Trainer product line. Growth also reflected improved performance in home gyms and a “modest rebound” in the strength category. Operating income for the direct segment rose 8 percent to $21.1 million and benefited from higher net sales and gross margins. Gross margin improved 110 basis points to 66.3 percent, thanks to a favorable product mix and leveraging of supply chain costs. Nautilus does not provide quarterly or annual guidance but officials updated its long-term operating metrics following the Octane Fitness acquisition. Its revenue target remained unchanged at 10 to12 percent growth per year. Its projections for operating income growth were raised from a range of 9 to 13 percent to a new range of 11 to 15 percent to reflect the post-acquisition environment that includes higher amortization and interest expense.